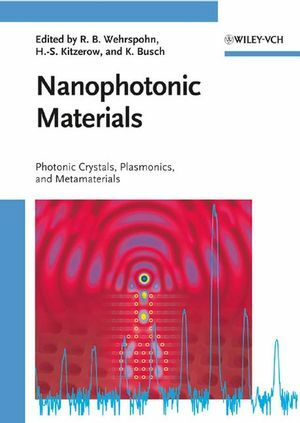 `Nanophotonic Materials - Photonic Crystals, Plasmonics, and Metamaterials' summarizes the work and results of a consortium consisting of more than 20 German research groups concentrated on photonics crystals research over the last seven years. Illustrated throughout in full color, the book provides an overview of these novel materials, spanning the entire range from fundamentals to applications. Ralf B. Wehrspohn studied physics at the University of Oldenburg, Germany, and received his Ph.D. degree from the Ecole Polytechnique in Paris in 1997. Until 1999 he worked on thin-film transistors for AMLCDs at Philips Research. From 1999 until 2003 he led the Porous Materials/Photonic Crystals group at the Max Planck Institute of Microstructure Physics in Halle, after which he held a chair at the Physics department of the University of Paderborn for three years. Since 2006, he has been the director of the Fraunhofer-Institute for Mechanics of Materials and a Professor of Physics at the Martin-Luther-University Halle-Wittenberg. Professor Wehrspohn was awarded the Maier-Leibnitz Prize of the German Science Foundation in 2003. Heinz-Siegfried Kitzerow was awarded a professorship for Physical Chemistry from the University of Paderborn, Germany, in 1998. His team works on liquid crystals and their behavior in complex geometries, polymer composites and thin electroluminescent layers. Professor Kitzerow serves as secretary of the International Liquid Crystal Society and is a member of the managing board of the German Liquid Crystal Society. He worked previously as a lecturer at the Technical University (TU) Berlin and visited the Laboratoire de Physique des Solides, Université Paris-Sud, and the Department of Physics and Astronomy, University of Hawaii, for postgraduate research. He studied chemistry and received his Ph.D. degree from the TU Berlin. Kurt Busch received his M.S. and Ph.D. degrees in physics from the University of Karlsruhe, Germany, in 1993 and 1996, respectively. From 1997 to 1999 he was the recipient of a post-doctoral scholarship from the DFG at the University of Toronto. From 2000 to 2004, Professor Busch was the head of a junior research program (Emmy Noether-program) at the Institute for the Theory of Condensed Matter, University of Karlsruhe. In 2004, he was appointed as Associate Professor at the Department of Physics and CREOL, University of Central Florida. In 2005, he returned to the University of Karlsruhe to accept a professorship in Physics at the Institute of Theoretical Solid State Physics. Professor Busch was awarded the Carl-Zeiss Research award in 2006.